Brad Hoggatt (left) and Anita Amspaugh were awarded Male and Female Volunteer of the Year, respectively, at the Union City Chamber of Commerce Banquet. 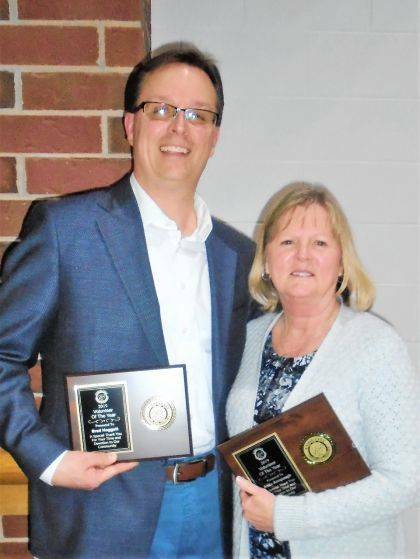 UNION CITY – Anita Amspaugh and Brad Hoggatt were selected as this year’s volunteers of the year and were honored for such at the recent Union City Chamber of Commerce banquet. Amspaugh, a lifelong resident of Union City, has been active in the community for a long time. Some of her past volunteer work, it was noted, includes being a Chamber of Commerce director where she served as vice president. She served on the cemetery board and served as a board member for Community Foundation of Randolph County. Amspaugh is on the Community Christmas Board and serves as treasurer. She organizes the Community Christmas Gift Shop, is a board member of St. Vincent Randolph Foundation, is chairman for the Union City Housing Authority Board and has been a member of the Union City Rotary since 2009. She served as Union City, Indiana’s clerk treasurer from 2004-14, and, although this was a paid position, there were lots of extras that went with it. With her current position, she serves as secretary for Indiana’s Regional Sewer District Association. She served on the board for the Indiana Association of Regional Council and Alliance of Rural Water. “In her spare time, she is also a wife, mother and grandmother and a friend to many,” it was reported. Hoggatt is active in many ways within this community. He is an active member of Wesley United Methodist Church where he has served in several capacities. He co-leads worship every Sunday and also is the chair of the church council. He has directed several cantatas for Easter and Christmas and has led small groups, helped at the Thanksgiving dinner, helped with children’s ministry, participated on mission trips, volunteered for Vacation Bible School, decorates the church for holidays and is working on a Mother’s Day special to honor Wesley Singers’ founder, Marilyn Peterson. Through the church, Hoggatt has started a ministry at the Assisted Living. Once a month, he leads a service with the residents and organizes card showers and giving of gifts for the residents. He is a teacher at North Side, having taught fourth grade and music for grades K-6. He has served the school in many ways. He has been on numerous committees, including serving as the RESC union president. He puts on music shows, a middle school play and a high school musical every year. He led the Ambassador singing group, which performed at many community events. He has helped with prom, carnivals, book fairs and graduation. He is the adviser of the National Honor Society, which has done home makeovers in Union City during the students’ fall break. He loves to throw a good party, which he does for the faculty every Christmas, and has hosted many retirement dinners. He also writes newspaper articles on behalf of the school corporation for the News Gazette. He cleans after basketball games or during basketball tournaments on the weekends at the school. He also has volunteered to work athletic events in the way of timing, judging, setting up, tearing down, announcing and taking tickets. Because he has three active children, he is always the first to help with anything needed at school including homecoming, fundraisers and dances. In addition to all of that, he also has helped clubs in the community. He has helped the Union City Lions Club by serving as the emcee for the Halloween parade and providing placemats for its pancake breakfast. He has served on the Randy Players board in many positions, including president, and also has acted in several of its productions. He has served on the State Line Heritage Days Committee working especially on the parade for several years. He has served as the precinct committee chairman for his voting precinct and served on the Union City Tiger Sharks Swim Team board in many positions including president. He was even the coach one year. Currently, Hoggatt is reaching out to the community by doing a “Boost” day for one lucky “friend” on Facebook. “Brad has a servant heart and a great love for his hometown,” it was said of him prior to the presentation of the award. https://www.dailyadvocate.com/wp-content/uploads/sites/34/2019/04/web1_Hoggatt-Amspaugh-web-1.jpgBrad Hoggatt (left) and Anita Amspaugh were awarded Male and Female Volunteer of the Year, respectively, at the Union City Chamber of Commerce Banquet. Reach Linda Moody at 937-548-3330 and follow us on Facebook by searching Advocate360 or The Early Bird. For more features online, go to dailyadvocate.com or earlybirdpaper.com. This entry was tagged Union City, Union City Chamber of Commerce. Bookmark the permalink.